Its time for a counter-service character breakfast in Yester-Fantasyland. Lets see who the characters are here. Notorious criminal Don Karnage interrupts the meal. Interrupting a breakfast of french toast sticks, its Don Karnage. In the Disney Afternoon series TaleSpin, Don Karnage is the captain of the Air Pirates. But in the picture above hes more of a Hair Pirate. Rebecca Cunningham towers over two breakfast guests. Rebecca Cunningham invites the young breakfast guests to pose with her. Astute businesswoman Rebecca Cunningham is the owner of the Higher for Hire Air Cargo Service in TaleSpin. 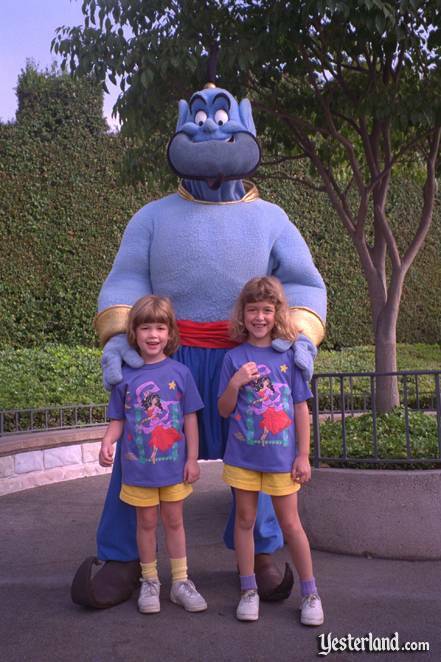 Its Genie, granting a wish for a posed picture. In addition to being the real star of the very entertaining animated 1992 feature, Aladdin, Genie is also in the Disney Afternoon series, Aladdin. 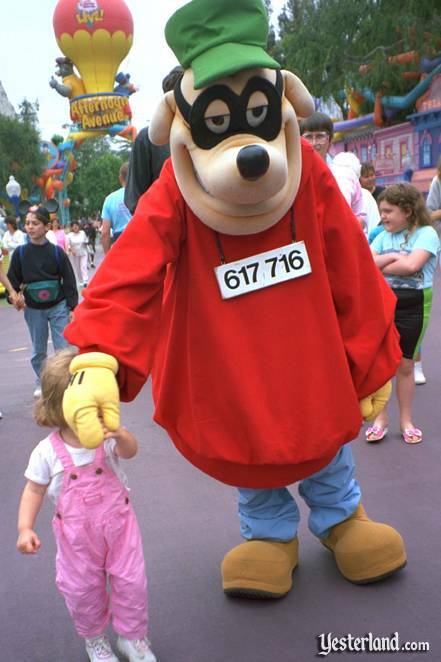 No, the Beagle Boy isn’t hitting the little girl in the face. While seeing the Disney Afternoon characters at the character breakfast, were reminded of an encounter with another Disney Afternoon character—one of the Beagle Boys—five years earlier at Afternoon Avenue. The Beagle Boys, a gang of criminals after Scrooge McDucks riches, were created by Disney comic book legend Carl Barks. The Beagle Boys have a prominent role in the Disney Afternoon series, DuckTails. Its Geppetto from Geppettos Adventure Squad. Of all the Disney Afternoon series, the least well known is Geppettos Adventure Squad. Woodcarver Geppetto from the 1940 Walt Disney masterpiece Pinocchio is a daredevil adventurer who gets out of dangerous situations by carving ingenious inventions from whatever pieces of wood he can find. There was no Geppettos Adventure Squad. But Geppetto is at the character breakfast too, perhaps because his wooden son is the proprietor of the Village Haus restaurant. In fact, if you look closely at the background, you can see his picture in the leaded glass window. Just as attractions come and go, characters come and go too. With the exception of the photo of the Beagle Boy, all photos in this article are from Fantasyland at Disneyland on the same morning in August 1996. Under the name “Disney Afternoon,” The Walt Disney Company syndicated a two-hour block of original, made-for-television animated series to television stations throughout the United States for seven seasons (1990-91 through 1996-97). Each block consisted of four half-hour programs. Each season, the line-up of shows was slightly different. By the sixth season (1995-96), when most of the photos in this article were taken, the line-up was Goof Troop, Bonkers, Aladdin, and Gargoyles. Strangely, although two of the characters in this article were from TaleSpin, that series had not aired since season four (1993-94). 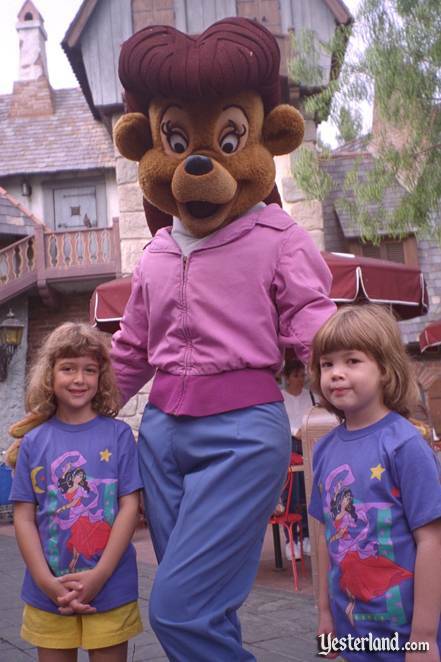 Theres more at Yesterland about how Disneyland promoted the Disney Afternoon. In 1991, The Disney Afternoon LIVE! was a temporary “land”—actually an overlay of part of Fantasyland. Also in 1991, the “Plane Crazy” stage show ran on Disneyland’s Videopolis Stage. Rafiki stopped by after breakfast. 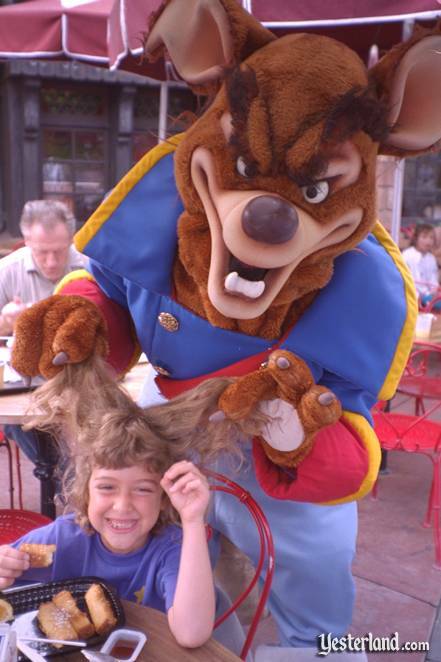 Photograph of Don Karnage playing with girls hair: 1996 by Werner Weiss. Photograph of Rebecca Cunningham posing with two girls: 1996 by Werner Weiss. Photograph of Genie posing with two girls: 1996 by Werner Weiss. Photograph of a Beagle Boy at Afternoon Avenue: 1991 by Werner Weiss. 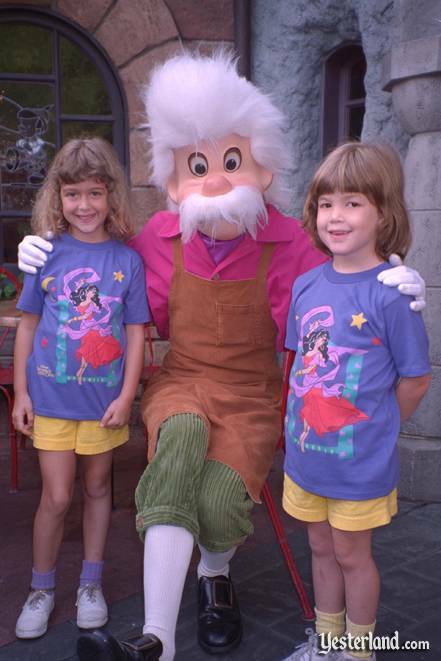 Photograph of Geppetto posing with two girls: 1996 by Werner Weiss. 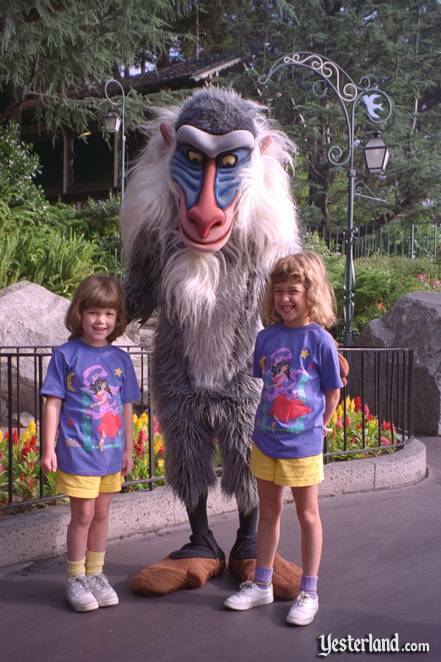 Photograph of Rafiki posing with two girls: 1996 by Werner Weiss.